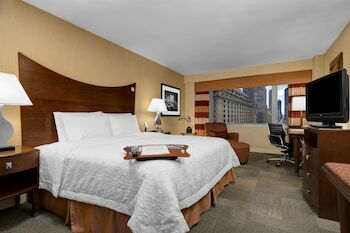 A stay at Hampton Inn Times Square North places you in the heart of New York, walking distance from Studio 54 and Ed Sullivan Theater. 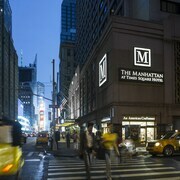 This hotel is close to Broadway and Rockefeller Center. 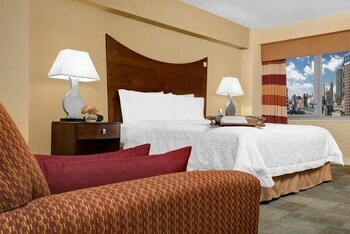 Make yourself at home in one of the 300 air-conditioned rooms featuring LCD televisions. 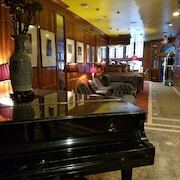 Wired and wireless Internet access is complimentary, while video-game consoles and premium TV channels are also offered to provide entertainment. Bathrooms feature shower/tub combinations, complimentary toiletries, and hair dryers. Conveniences include safes and desks, as well as phones with free local calls. 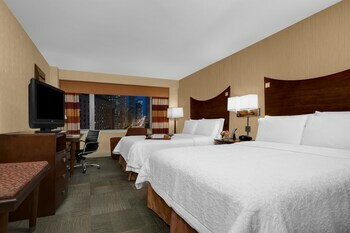 Grab a bite from a snack bar/deli serving guests of Hampton Inn Times Square North.